There is a great deal one could say about the cake you will find pictured below this humble paragraph. One could say it’s very creative. One could remark upon its fluffy-looking icing, or its haphazard candle placement. One could say that it, like the Pizza Hut Cheesy Bites Pizza, looks somewhat like the Pale Man from Guillermo del Toro’s Pan’s Labyrinth. One could say all those things, and more. But if one is me, one’s eye is most drawn to the salutation etched in icing across its very face, a greeting of such abundant warmth that it borders on the indecorous, a greeting simply popping with emotion, a greeting worthy of a sonnet, or perhaps a duchy. 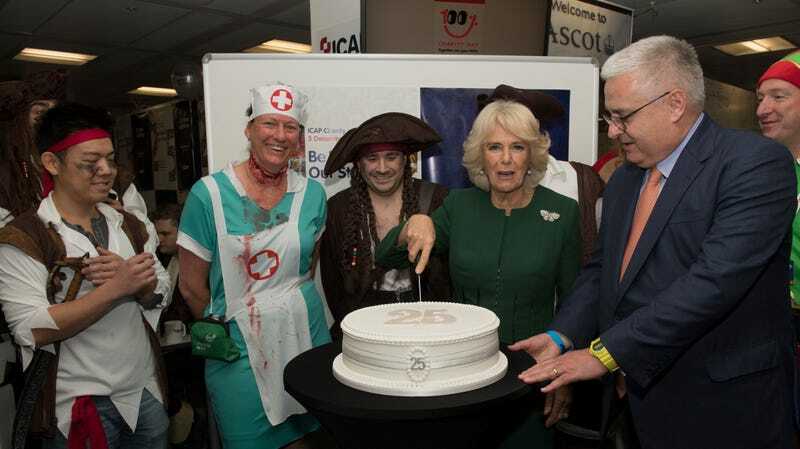 As the fine people of The Cut most sensibly note, “ma’am” is, in fact, the proper way to address Camilla, Duchess of Cornwall, GCVO, CSM, PC, after first addressing her as “Your Royal Highness”; one assumes the first cake said “Most Felicitous Greetings Your Royal Highness,” thus ensuring proper etiquette before the more exuberant of the two cakes debuted, this one using the more informal “ma’am.” One assumes this because otherwise this most, erm, creative dessert would be guilty of unfathomable rudeness to her most royal personage. Yet one is inclined to forgive such a slight, even from a baked good, because one is simply overwhelmed with the warmth, the regard, the cherished affection this iced confection communicates, with its wreath of creepy carrot fingers and its swirly pink mounds. One suspects this may have been nearly as warmly received as the wallaby tartare lately presented to His Royal Highness Prince Charles Philip Arthur George, Prince of Wales, KG, KT, GCB, OM, AK, QSO, CC, PC, ADC, Earl of Chester, Duke of Cornwall, Duke of Rothesay, Earl of Carrick, Baron of Renfrew, Lord of the Isles and Prince and Great Steward of Scotland. Now go ahead and try to unsee this, you rabble.